Five months later, Melissa hadn’t found anyone else, and Jason wasn’t looking so terrible. Then she heard me talk and listened as I described the essential qualities for a strong marriage—many of which Jason possessed. I’m always going to dodge this—it’s not my right to tell someone I don’t know whether they should marry someone I’ve never met. But she wanted some general advice and here’s what I said. “I’m usually wary of people who have dated for five years and aren’t eager to get married. Ideally, I’d like to see you over the top eager to finally become husband and wife. The fact that you’re still not so eager after such a long time isn’t a good sign. I’d rather singles spent time talking themselves out of a relationship than talk themselves into staying in one. It’s never a good sign if you have to keep talking yourself into staying in a relationship. More often than not, if you’re consistently doing that, it’s a sign that you lack the courage to make a needed change that you already know, deep down, that you need to make. It’s okay—even wise—to conclude, “He could be a good husband, but I want a great husband.” “She’ll be a good wife, but I want a fantastic wife.” The fact that you can’t commit, even knowing him/her so well is probably evidence enough that you need to spend a little more time looking for someone else. What I’m saying in shorter form is this: it’s okay to pass on someone who’s a “good” match if you’re still looking for a “great” match. You don’t have to declare that someone is a total wreck to let them go. Essays like this are so important to brnnieadog people’s horizons. Yes, I’m involved with my church, campus ministry, helping other groups through my writing and speaking, etc. But what am I most involved in? One word. Jesus. I am into Jesus. No other tag, title or license comes close to competing. So don’t let the “extra stuff” that the American culture of spirituality promotes dominate you — the stuff many of us do (if truth be told) at least partly to show others or ourselves how pious we are. God in the flesh never tried to impress anyone by playing their religious games. Why should we? Give me the pure, unadulterated Gospel of Jesus Christ. No more. No less. After the resurrection, on a lonely beach one morning, Jesus described to Peter the kind of martyrdom he was to endure. When He finished, Jesus fixed His eyes on the disciple and simply said, “Follow Me!”(John 21:19). But instead of saying “Yes, Lord” and accepting his destiny, Peter threw his own private pity party, wondering aloud why he would have to suffer such a cruel death, while the other disciple, John, would not. But there was to be no debate that day. The Master’s final words recorded in John’s gospel were to Peter when He once again (with emphasis) commanded: “You follow Me!” (John 21:22). Some may say that feels like being drafted into God’s army against your will, but in reality, it is an invitation to be a close friend and companion with the creator of the cosmos. Many so-called Christians strive to live religious lives out of the “ought to” rather than experiencing the freedom of following Christ out of the “want to.” You’ll want to go through this exercise of getting in touch with your own personal motivations, but besides the fact that God chose me (read Ephesians 1) here are six reasons (there are certainly more) why I choose to be a Christian (sorry — I meant “follower of Jesus”). We need to help all people — even true believers — understand that being a Christian is not just a title or label. It is something you are and something you do.You believe in Jesus, so you follow Jesus. Wherever He leads. This implies lordship. So maybe a re-definition is in order. Could it be that a real Christian is someone who is truly following Jesus? Not in sinless perfection, of course (we’re all far from that), but overall living out of love for Him Who first loved us? It seems your no longer replying to comments but I genuinely am struggling with the concept of personal relationship with god / his plan for us / letting the Holy Spirit guide our decisions vs evaluate your spouse against a checklist and wear the burden of a poor decision. To me it seems contradictory to say it’s possible God will lead you to someone but don’t get your hopes up (para phrasing blog premise). How can I really trust if it’s the Holy Spirit or my just own free will on any area of my life? I see your reference there is a bible verse about the person having certain qualities. Counsel etc. but does this overrule doctrine that the Holy Spirit will guide your decisions if you submit to gods will? a way to Rationalise the confusion and potential god blaming of marriage breakdown or is it really unlikely the Holy Spirit will guide you to find a spouse as a general principle if you seek guidance? Am I hearing anything from god at all or am I biased because I am just trying to rationalise continuation of the vision of gods will because of my own will for this girl? I cannot answer the above questions to myself. I felt strongly god was telling me someone was the one even when in my own will I was resisting but now doubt all the guidance I have received. I feel/felt I am called to ministry and one particular girl to support me in that mission and now I am having doubts about my own faith and purpose. If A isn’t true how can B be true kind of thinking. I’m only a very recent Christian but I am struggling with the underlying concept to not trust your ability to hear the Holy Spirit regarding spouse. How can I not doubt all knowledge or guiding done by the spirit under that theology. I’m not trying to argue or convince anyone of anything except myself. I am hurting and confused. Sorry if I’m ranting or repeating but this is on my heart. Someone please help me because previously I felt at peace trusting god but now after reading this post I don’t knew what to think / feel / trust about anything. Seem there are no answers on this blog anymore, but I will reponse – please keep in mind the theology behind the response. You are exactly right – there is an inconsistency as you said “To me it seems contradictory to say it’s possible God will lead you to someone but don’t get your hopes up (para phrasing blog premise). How can I really trust if it’s the Holy Spirit or my just own free will on any area of my life?” The thing is, free will and God’s Spirit are not confused – it is like conversation between 2 living persons – you can discern your own thoughts and you can discern the direct answer of Someone else to your thoughts. No, these are not opposite. Biblical qualities and counsel go hand in hand with what God is communicating personally to you – in fact the synergetical leading through objective biblical principles and personal subjective understanding discern indeed that it is God’s guiding and not some personal preferences. It is with Scripture and its principles that we validate our experiences to be true, rooted in our genuine communication and relationsip with God. Still one has to get answers directly from God concerning principles, for some times people in counseling just put thing in a box and speak of their own experiences/prejudices. For example, restraints of marrying a young believer. Yes, – it’s possible you misheard the Holy Spirit with your own feelings – and it\s not necessarily a rationalisation. You have to be very careful and aware of your own desires and feelings but at the same time, talk to God about all of them. Don’t be afraid, He knows them and as you discern your heart with Him and before Him, asking questions about your situation and decision to be made, He will answer you DIRECTLY to your issues, and you will have the certainty from the Spirit that it is indeed His voice and asnwer to you. Finding God’s will is not a one-time moment, like putting a fleece and going on with that – it is often a long process of people adjusting their hearts and motives before God and then discussing all issues involved in the decision with Him, and finally arriving at some point to a conclusion/decision with God. I am so sorry for all confusion and hurt you are going through right now. I can testify from my own life, thateven in good faith and sincere heart looking for God’s will, I was mislead. The thing that makes the difference is exactly the process in finding God=s answer – the times than I was misled, the process was missing, my restling and discerning with God in a long process was not there = I just took a single message as my answer, and it wasn’t true. At the same time, during the genuine process of discovering what to decide, it is possible that God is telling other things and not exactly what we want to move forward one way or the other. But keep pending on the answer, keep being there in this process with God = at the right time He will say what is needed to make a decision. It is a process that not only will lead you to a God-decision if you obey what you understand He tells you, but changes also your heart into His more likeness. If you are confused about your previous calling and guidance, don\t be afraid – just repeat it and go back to the start with God in this spiritual process. If it was real, than you will find the same conclusion regarding your calling and marriage. If not, you will find the new genuine calling and understand where you were mistaken. Take heart in your own relationship with God. No one except you can interfere there, and mislead you. Depend on His love and goodness, and prepare your heart to surrender unconditionally to Him, for sometimes His answers and plans are contrary to our expectations and desires. Instead of contradicting the given arguments – like I’ve done with Gary – with valid arguments, start attacking the person and derail the trail…..
Not sure why you are continuing to beat us with the same point over and over. Or the need to attack each of us…I see no where in scripture where that is. I haven’t read anything that would bring me to the conclusion that anyone is saying we should NOT be in prayer and talking to our Father about who we spend time with, who we date or who we marry. What are your thoughts on how God will reveal the answer to you on who you should date and marry? I kindly asked Gary to reconcile his statements with mine, in good faith, IF indeed we are saying the same thing, and our arguments are not opposite. Nobody has done that, yet. I am not attacking anyone, I want to get a conclusion after this exposure of ideas. If you don’t find anything in Scripture, keep studying until you do. /Yeah, in theory as Christians we say we pray and study about whom to marry…in practice we just want to make our own “free independent choice” using the mind and “wisdom” and free will God gave us. While reading Grace’s post I thought Deb Fileta blog or book would be helpful. I’m glad to read she will be a guest of yours. I appreciate your wisdom Gary. The analogy you gave regarding food choices for your daughter was excellent. It sounds much like the advice my Pastor gives. If we are spending quality time seeking God and His Kingdom He will speak…but it most likely will not be an audible voice. He may lead thru Scrioture or thru others or circumstances. But then there’s also…God shows us the respect we show Him. He may just say that we have sought Him with all our heart now my child you are free to choose who you desire. This certainly keeps us desperate for Him so that our heart is aligned with Him. I find the analogy of food choice and spouse choice at least insulting. Nevertheless, Gary, your problem with this thinking of “”independent free choice”” is that simply, it isn’t true. We are never independent to do exactly what we want, for so many reasons and conditions put upon us, that we foolishly don’t even realize. And even so, we ARE in a REAL relationship with a Person – so we would choose what He likes most, even in matters of food and spouses. Being a relationship, one is constantly interdependent on the other. That’s how you prepare meals for the family – not everyone is eating what they choose to care for? The greatest lie that Satan and our ego is telling that in some form or circumstances we can do whatever we want. Well, we are not all alone in the Universe and if you do have a loving obeying relationship with God and His Kingdom, you are even more conditionated in your “”independent choices””. That was exactly Lucifer’s problem – wanted independence from God and being like Him – and we know what lead from there. We are free to make many independent choices.. sometimes there isn’t just one good choice. Sometimes God provides 2 good choices.. I have been offered several jobs to choose from, I prayed about them, weighed the pros and cons, chose one and have been very happy even though its not perfect. I believe I could have been just as happy with the other choice. The important thing is whether these choices are dishonouring to God or disobeying God. If thats the case then we will have consequences. But on the other hand, God is full of mercy and grace and will not abandon us either way. You keep ignoring the RELATIONSHIP part of every decision. It doesn’t matter how many good choices a family has, in the end they choose together, into their family relationship, just one. The same is in the man’s relationship with God: no matter how many choices SEEM good to him , in the end he will choose what’s most pleasing to His beloved Lord. Good grief, IS THIS SO DIFFICULT TO UNDERSTAND???? I am starting to wonder what kind of relationship – if any = do born again Crhistians have with God, as they pretend to do so. And why is this choice more pleasing to Him than another? Because He is sovereign and has a SPECIFIC PLAN for everyone;s life. less of the above conditions. I’m not ignoring the relationship part of anything.. the only real command regarding marriage was to be equally yoked.. Christian marry Christian. I consult and pray to God about every major and some minor decisions in my life.. I do not consult him on every meal I make or eat, although I may very carefully weigh whether I can afford to eat out or not. I do not lay in bed waiting for the Spirit to move me to get up. I read the Word, I pray, I try to be kind and loving in my decisions and actions. And if God provides me with several options to choose from (for a job, example), he doesn’t always tell me “No No NO! Not that one!” He gives me reasoning and discernment to choose the what I feel is best at the time. But even if I make a mistake in my choosing.. God still will not abandon me. Obviously, its easier to get out of a bad job then a bad marriage. But unless the marriage is abusive or there is infidelity, I must ask God to change my perspective on the problems and still love the man I chose to marry. How do YOU know which choice is most pleasing to Him? Isn’t it possible that you can get caught up in your own feelings and think you are pleasing Him when in fact you are just pleasing yourself? That is where listening to the truth of scripture comes in. If I have 2 Christian men to choose from and they are both strong in their faith and walk with God.. then I am going to choose the one that seems more compatible with me and my walk with God. My choices, my approach to life, although now focused thru the lens of my Saviour, are still unique to me and the way my life, experiences and culture have formed me… God uses each unique individual for His own purposes in His own way. Your way of describing Independent… I get it.. God created us, He knows our story and how we will respond because of where He placed us in this world.. but what about free will? We always have a choice of our own choosing and therefore there will be consequences for such… if my choices were not my own, then why should I be punished or blessed? To be honest Roxana, I wonder about your relationship with God… his #1 command is to love one another, to show love, to correct in love.. but your responses are more like attacks, quite aggressive and almost flippant in your approach. Yôu re ignoring the God-man relationship in deciding, not the relationship between people. Please read carefully the comments, I don’t have time or space to correct every misunderstandig of yours. EAting and choosing a job is different than choosing a spouse, but by all means, choose whatever you like. God does give discernment and thinking and every psychological faculty He gives humans, that’s not saying we should only use those – then, why do we need God in our life, besides providing the ticket to Heaven? In marriage 2 persons have these faculties, but they decide together on more than their individuals faculties – for the COMMON benefit of the family. A thing that individualistic materialistic American christians are strangers of, it seems. In arabic cultures, one marries, for example, for the benefit of both extended familieis – and so their “”marriage choice”is even more restricted than with western european and american. and they are fine with it, and they don\t even pretend they do it because of God’;s will. Instead Christians do it their own way, even when pretending they are a DUMB SHEEP having a LOVING SHEPHERD. To be honest KAren, you are accusing me of not being loving, in fact because you have nothing to respond to what I say. If you cannot find anything, then accuse the other of what you can – and being unloving is the easiest reproach since you cannot prove it otherwise online. I am not talking to you about free will, your choices and your responsibility to your choices – go read some academic theologians for that. A man does have a free choice: to obey God as he understands His leading or to do whatever he thinks is good, wise, counseling, moral etc. I am tired of this discussion which is in vain, as I see, so if you don’t have any other arguments, I am done responding. Thanks for all of your wonderful advice and wisdom, Gary. I am almost finished reading Sacred Marriage and it has been life-changing! I suppose I should’ve read Sacred Search first. Do you have any books, articles or advice geared towards long-distance relationships or those preparing to marry who have spent so much of the relationship apart? Thank you for thoughtfully responding to so many questions in this feed – i found them just as useful as the article! You mention preferences, and that we have choice and human reasoning given to us by God, etc. I have been dating an amazing man of God for the past year and there are no red flags. I am sure we would be a fruitful couple who would be able to serve God better married than single. However, I always imagined I’d marry a certain type – authoritative, alpha-male, successful, established financially. He is not these things. Are these preferences that I should wait for? I think about it often and wonder if there are godly men out there who I might meet if he and I break up. It’s not that I need reasons to marry this guy – I have plenty. I just don’t know if the things he is “missing” (preferences – not character issues) are necessary for me to get to the point where I will never regret marrying him. A mentor told me to pray over this and make sure I know that God led me to marry this man and God is calling me to marry him. Should I be praying for this? Or is this trying to force God’s hand? What should I be praying about then? You have to make your own theology straight. Your counselor is opposing what Gary writes on this blog – there is no need to pray to God for His leading you into this marriage for the decision is up to you…Isn’t this clear from what Gary writes? Stop oscillating between what people say, liKe Gary and this guy, and make up your mind about what you believe. Then act on your beliefs and take it to God. It’s neither wrong nor right for you to seek these other qualities. Just make sure you deeply respect him. If you can’t respect him (in the absence of these qualities), a marriage to him would have some core difficulties. 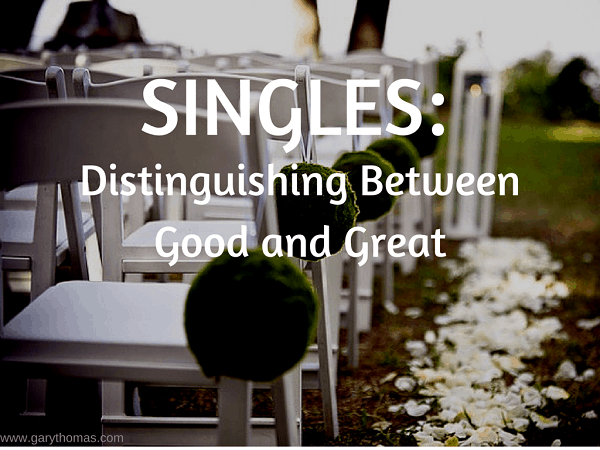 FYI, we have another post for singles coming up soon, written by Deb Fileta, that will address your concerns a bit more. It should be out within the next couple of weeks. I do disagree with your mentor here, as I don’t agree with the premise–that there’s one person you’re supposed to marry. I don’t want to put God in a box here, so if you’re the exception and there IS one person you’re supposed to marry, I don’t expect He’d leave you hanging in indecision. And I certainly don’t think it’s wise to make such a momentous decision by looking for coincidental signs from heaven. Most of what I’d want to say here are in chapters 9, 10 and 13 of The Sacred Search. Instead of trying to figure out some mystical leaning, think this through, talk this through, search your heart, and make a decision in faith knowing that God will be with you regardless of what you decide. As to whether you’ll ever regret marrying him–as I have surveyed couples, it’s more common than not (during short, difficult seasons) for people to occasionally regret their choice (not on an ongoing basis, but at times). Marriage isn’t easy, so you can’t find anyone who is a perfect match and who will never let you down, leading to the temptation of regret. But if you find a healthy person who interests you, shares the right values, seeks God’s Kingdom and righteousness, is filled with the Holy Spirit, and who cherishes you, you can have a wonderful and fulfilling marriage. Even if the premise that you can marry a bunch of godly Christian men, and not “the one person for you”, you still have to make a choice, and marry just one man. So, even with this premise, asking God about whom to choose as your spouse from the full pool of eligible candidates, is still valid question and sound theology. so again, what are we talking about here, Gary? The real issue is not how many options we have to choose from, but if we choose alone using our mind, search, criteria etc or if we choose by obeying what we understand God communicating us regarding the issue of choice. Gary, please stop making false dichotomies. You seem to have a personal agenda to “attack” Gary, a brother in Christ. I’ve read through this entire thread and I honestly don’t understand where you are coming from and why you are so vicious and caustic in your replies. Gary is not encouraging singles to not consult God’s guidance in choosing their future spouse. Yet you seem to think he has a theology that avoids talking with God and seeking Godly wisdom in our decisions. May I encourage you to seek God’s guidance in your own actions, words and deeds when posting things online. Rather than attacking a brother who is trying to help fellow believers in their walk with God, why don’t you start your own blog to do the same thing and you can share your own advice and beliefs in the way God leads you to do so. There’s enough fighting in this world that we really don’t need to be fighting fellow believers. Thanks for your “”concern”, you are way off with your assumptions. Gary is a public figure, he can take care of himself and defend himself if needed. I am tired of people, public speakers, being inconsistent and manipulating ideas to suit their preconceived notions about god, life and people. If you want to respond, Gary, to my questions, it’s fine. If not, or you try only to get winning the arguments, it’s even better – I don’t need that. I hope I have expressed well the inconsistencies in your line of thinking. If not, sorry. I guess that’s all. A good friend of mine always says, will you continue to love that person even if those “traits” never change? Do you love him as he is now or are you hoping a change will come in time? Everyone has potential to be better.. not all reach that potential.. so don’t marry someone for their potential. I married a good godly man who was different than what I expected I would marry I sought God’s guidance A LOT and finally decided that if I was seeking God’s will, giving him ample opportunity to say yes or no, but God didn’t make his preference clear then perhaps I should make the wisest decision I could with the counsel of others. I figured if God didn’t want me to marry this man, he’d make that clear, at least if I was asking, seeking and listening. I also realize that God doesn’t tend to speak to me as clearly or as often as he seems to with others (especially regarding these huge decisions!) but he does speak to me sometimes. God loves me, leads me, and guides me but not always in obvious ways and, I agree with Gary, the Bible doesn’t teach that he owes us a clear answer about everything we ask him about. So I asked a lot, listened a lot, waited a lot and finally married the guy. 12 years into the marriage I am so thankful for the partner that he is. He’s not perfect, I’m not perfect but we’re really good for each other. I’m still a little jealous of the clarity some of my friends seem to have when God speaks to them, but I’m increasingly okay with the fact that my relationship with God might look different than other peoples’. YES, God DOES NOT OWE us anything – love, salvation, His Spirit in us, answers etc. But as a loving Father and Shepherd, He does answer us when we need it most. 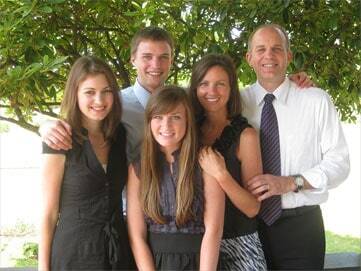 That’s Bible’s teaching, not some preferences He has with some of His children, and some of their experiences. Glad your marriage is working out, regardless how you decided. Gary, I’m so glad to have ran across a Facebook link for this article and blog. I bought The Sacred Search last year and need to pick it back up. But just today I sharing with someone today with my level of frustration, and if I be honest the feeling of loneliness and lack of favor or worthiness, about not having a relationship but not being married. I have prayed for 20+ years that God would let me know true love and have a husband. And despite my efforts to stay focused and honor God as a good Christian woman, I find myself feeling heartbroken because I have believed and trusting for this one area while pouring my heart and service to others….. Thanks for taking the time to respond. I will definitely do as you suggested! I’m thankful that you use this platform to encourage others and honor God. I try not to be ungrateful or dishonor God. I really try to live accordingly to His Will. But I have felt discouraged because I feel I just don’t get it. Some make me like there’s some lessons still to learn, it’s not my season etc. and sometimes I feel like I’m equipped “wrong”….. in today’s culture you would think I wouldn’t feel so. But when I was younger (24), I got pregnant and then married…then quickly divorced, which makes me feel like maybe this is the fruit of my actions. Nonetheless, I know God is loving. Yet the continued desire for companionship feels like a fairy tale and nightmare. Getting this out and going to your book and the Book, will hopefully help 🙂 Thanks so much. I’m at a point where I feel I’ve been extremely graceful in waiting for my partner to “figure it out”. It just doesn’t feel right waiting for him to make the decision. He finally put a time frame on that decision which is June because of my pressure on him. But if he hasn’t figured it or has to convince himself to marry me, I feel I deserve better. He’s proposed and taken it back in the past because of his fear of commitment or feeling we aren’t compatible enough to build a strong foundation, so we’re working on the building blocks. It just seems I have to do x amount of work to make him feel better about marrying me and it feels terrible. Marie, obviously I don’t know anything about your situation, but let me ask you this: if someone can’t cherish you as a girlfriend, will they ever be able to cherish you as a wife? And don’t you want to be cherished? I’m sorry! I just realized that someone else asked pretty much the same thing before me. Well, a more particular response wouldn’t hurt. Again, though, it’s a matter of preference: are you content in your singleness? Or do you think you perhaps can serve God better and be a more well-rounded individual if you marry someone who has certain limitations but overall is a solid choice? The reason I can’t answer definitively is that I don’t know your (or anyone’s) life call. Some lives might well be better served being lived as a single. Others would benefit from joining together with a spouse. Others might be able to be lived out either way. Where I think singles get confused is that they try to get God to answer their “preference” for them–and thus twist themselves into knots trying to make some cosmic sense out of a situation where God wants them to apply the high level of reasoning He gives to humans. So instead of examining their heart’s desire, applying biblical values, seeking counsel, and looking for wisdom from Scripture, they set out “fleeces” or other silly things to try to force God’s hand. Beware: just because WE think God “owes” us an answer doesn’t mean He will give one. We can’t force His hand. you don’t listen much to other ideas and arguments, do you? What in the world is so difficult for you to understand, that you don\t force God’s hand or try to make a cosmic sense out of your decision, simply you are consulting a living Person regarding your life and major decisions, and This Person who is your Shepherd is answering you? Roxana, perhaps I’m just poor at communicating this, but I consult that Living Person every day. He knows I seek His wisdom on decisions much less significant than marriage. I talk over EVERYTHING with Him.. I’m just convinced from Scripture that God doesn’t normally set apart just ONE person we’re supposed to marry. Insisting that God choose “for” me when He leaves it up to me is a misunderstanding of His providence and the way He created me to function. Though this may sound like it’s trivializing the decision, if my daughter asks me, “Should I have the chicken and kale salad or the spinach and shrimp salad?” my response would be, “They are both relatively healthy, so get whatever one you want.” In the same way, you can be interested in two relatively healthy individuals to marry and God may say, “Pick which ever one you prefer.” On the other hand, if my daughter asks me, “Should I have a Big Mac or a Turkey Wrap?” Well, one is nutritionally superior over the other, so it’s possible I might have some stronger words in that situation. But just because the turkey wrap is superior to the Big Mac doesn’t mean it’s superior to many other healthy options. The same is true with choosing marital partners. Some ARE better than others, but that doesn’t mean there’s just one right choice. I simply disagree. He didn’t ask me who I want to be my parents, in which historical time to be born, in which country etc. He has sovereignly chosen for me all these things, without taking away from me my responsibility in life. So what misunderstanding is me asking Him: Is this the person You want me to be married to? I function as a responsible volitional human being in both cases, when I do ask Him this question and when I don’t. The difference is only if I am interested in His answer and be obedient to that answer or not. With all due respect, I am coming to believe you are the one misunderstanding God’s dealings with His children and the Shepherd’s dealings with His flock. I wonder- what about are you talking to Him? The moral choices are clear through the Bible, you feel you have to choose on your own on the relative same healthy choices, so what exactly are you asking God? And what did Lord Jesus Christ tell you? Did you return to your lover and be happy again? MAny say they know God but in the end He will tell them: Depart from Me for I don’t know you…..
How does one know if he truly knows God? Hi Gary, thank you for this information! You mentioned a couple of times that she is too young to settle. And she’s at an age where she could take more time to look. Does that mean that women in their mid to late 30s should consider marrying someone who is a good guy, even if they aren’t that interested? I agree 100% with what you are saying. But I have seen the opposite problem – of someone who is with a “great” match but won’t move forward because they are afraid of making a wrong choice, and in effect, are looking for perfection. The issue, I think, is in discerning the difference between “good” and “great.” Especially for couples who are older (40s) than the girl in your example. How do you make that distinction? It’s a matter of preference. Because I don’t believe the Bible teaches there is one “right” person for each one of us, and because 1 Cor. 7:39 specifically tells widows they are free to marry “anyone they wish” as long as he is a believer, it really comes down to a person’s preference. So the general principle is this: if you have to talk yourself into marrying someone, you’re probably settling. It’s not wrong to settle, but you might come to regret it. On the other hand, if you hold out for the “perfect” match that doesn’t exist, you might well end up living alone for the rest of your life–or for a much longer time. But many singles live fulfilling, happy lives. So it’s a choice. What matters most is seeking first God’s Kingdom and righteousness (Matt. 6:33), not whether someone is single or married. Gary, Sacred Search was so helpful to me and I recently ended an “ok” relationship (that, looking back, wasn’t even ok) after really considering what you wrote and realizing that who I marry is my choice, not my destiny. So thank you! It;s the third comment in the same post with you saying the same thing. I have commented before on your blog and realize that as a married man I am not the audience on this post. I wonder often if I should not have married my wife. Not because of anything wrong with her but because I was very scared and anxious of dating and had a hard time staying in the relationship due to commitment issues. Through counseling I got through this and was glad to marry her. A few years later some of those fears have come back. I sought out so much counsel before we got married and everyone (pastors, counselers, mentors and friends affirmed that I should push through my fears of commitment and anxieties and fight to marry this woman because she was a great catch and complemented me well. I did so. Not under duress but joyfully believing their advice to be true. I try to trust that I have made a wise choice but fear deeply that I haven’t. Could there be someone better for me? Sure. But I desperately want to be married forever to my wife as I vowed and I will. The question is: will God punish me (and others who struggle with this topic) for my choice by refusing a satisfying marriage? Is it impossible to experience intimacy for people who marry good matches but not great? Hi ……maybe this will help you. I was married for 7 years when I left a very unhappy situation to live with another man….I was happy until one night I had a dream and saw Jesus Christ and was commanded to return to my husband. I had no intention of doing that however I was literally compelled to do so and after six months we were reconciled. I was not a Christian didn’t go to church and had never read a bible. I have now been married for 45 neex t week and am writing my memoirs of those years hopefully to help and encourage others……not to keep trying in their marriages….but to seek and focus on Jesus Christ alive and working in the world today. J, your response really is indicative of what I believe to be a misunderstanding about marriage in general, even more than your marriage in particular. Now that you’ve made the choice, your wife has become not just the best, but the only choice, and your call is to learn to love, give, serve and sacrifice. It’s wasted time–and destructive–to try to re-think it. Now, your call is to become the best husband you can be out of reverence for God. “Out of reverence for God” means we are motivated not by who our spouse is, but by what God has done for us. Every second you waste trying to re-evaluate this prior decision is a second you steal from making your marriage stronger, more intimate and ultimately more satisfying. I think you’re giving in to some temptations here, probably not even realizing they are temptations. As a Christian brother I urge you to take control of your thoughts and focus on what needs to happen now, now something that happened in the past. God won’t punish you for making the decision you did–but He may well discipline you for neglecting what you have committed to do–and that is to love your wife as Christ loved the church. If you’re looking for Skype counseling, Dr. Mitch Whitman (from Bellingham WA) is one of many excellent choices (you can google his name). i too am married and I still ask myself if I could turn back time would I still marry my husband. Sad question to be asking after 45 years I was only 16 when we met didn’t like dating and just wanted to be secure in a marriage relationship with somebody who could look after me. My husband has fulfilled all those desires to be loved and cared for. But as opposites who can’t community well ….and I’ve become a completely different person from that shy insecure girl now I crave a lot more from our marriage that my husband can’t provide. ……..in 1978 I had an experience that changed my life I left my husband and lived with another man for six months ….I was very happy …..that is until I had a dream and saw Jesus Christ and was commanded to return to my husband. Of. Curse I had no intention of doing that but strangely six month later we were reconciled. I was not a Christian I’did not go to church I had never read a bible. Today I am writing my memoirs of those years……hoping to encourage others in their marital trials.